Anesthesia-Free Dental Cleaning | Purrrfectly Holistic...a Boutique for Cats! Purrrfectly Holistic…a Boutique for Cats! Rocket gets ready for his exam and teeth cleaning. 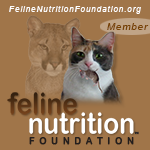 I love sharing alternative methods, products and services to improve the lives of cats, which is why I created this blog. Today my cats experienced something they’ve never done before, and I’m so excited to tell you about it! Have you heard of anesthesia-free dental cleaning? Anesthesia-free dental cleaning is becoming more popular even though it’s been around for years. Animal Dental Care, the company we used today, has been leading the way since 1992. The technicians are experts at maintenance, preventative oral screenings and cleaning in a safe, comfortable manner. They work under the supervision on a veterinarian to do a complete oral exam, cleaning, polishing, brushing and rinsing. They also point out any abnormalities or concerns (like loose teeth or tooth resorption) and make recommendations for a treatment plan. 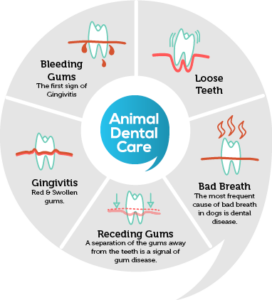 Here are some quick facts about oral health care for pets. Cats who go a year without oral health care have a dramatically increased risk of developing some form of dental disease. This includes bleeding gums, loose teeth, gingivitis, receding gums and bad breath. Bacteria forms on the teeth within 24 hours of a professional cleaning and needs daily removal. Plaque can calcify within 48-72 hours and gingivitis can occur at just 2 weeks. Gingivitis is reversible but periodontitis requires surgery. Not maintaining oral care can lead to possible infections that affect internal organs. Dental disease is one of the most common and overlooked diseases pets develop. When the technicians arrived they selected a place to sit on the floor with good lighting. 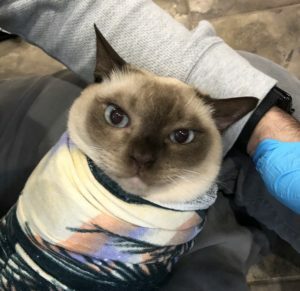 Wrapping the cat in a towel like a “purrito,” and their legs around the cat, they would start by just making the kitty calm and relaxed. They started by making a precursory exam and then got to work scaling above and below the gum line. All the tartar and plaque was gently removed with the delicate and gentle precision of a skilled surgeon. Amazingly, they were able to keep the cat calm and still enough to clean all 360 degrees around the tooth! Next, they polished each tooth in the same way that dentists polish peoples’ teeth. 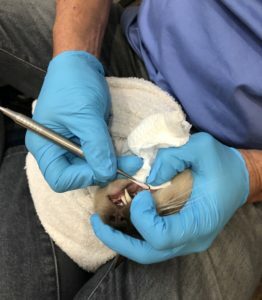 This was followed by rinsing the mouth, wiping out any remaining debris, and checking to make sure all teeth and gums looked clean. Lili and Gunner didn’t make a sound the entire time. Rocket and Aylen, were not as compliant in the beginning. Aylen started out growling but turned into an angel after a few minutes. I never heard another peep from her! Rocket kept loudly protesting the purrito in the beginning, but once he was able to sit freely in the tech’s lap he never made another sound. All four were finished in under an hour. When the technician was finished each cat was given 4 drops of a homeopathic remedy designed to kill any bacteria that may been released into the bloodstream. They were also given a B12 shot to aid in fighting off any disease. As each kitty was unwrapped and released, to my surprise no one ran away in terror. In fact, they would just saunter away like nothing happened! Wow! I was also shown the best way to brush my cat’s teeth. In the same manner they did, find a place to sit on the floor with good lighting and wrap the cat snuggly in a towel. Using my legs to help hold the kitty in my lap, I cup my hand over the cat’s head, tilting it upward. It works best to keep the mouth closed. Using my thumb to open the side of the mouth, brush the toothbrush along the gums and teeth. I’m sure this will take some practice on my part to master! Ideally, brushing everyday will help keep the tarter and plaque from building up. Using an enzymatic toothpaste formulated for cats along with treats like C.E.T Chews help control plaque. Anesthesia-free dentistry is not complete dental care, however. Techs are not able to take x-rays, which allow your veterinarian to see what’s going on below the gum line and the root. This is why it’s important to have dental x-rays annually. In order to prevent plaque and tartar buildup, it’s best to avoid dry foods like kibble. 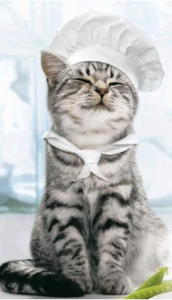 If your cat eats a raw diet, consider offering chicken necks, wings, or baby quail cut into large bite size pieces. Chewing raw bones helps scrape tartar off teeth and massages the gums, keeping them healthy. Have you used anesthesia-free dentistry with your cat? If so, share your experience in the comments below! Gunner is a good patient! Very informative. Thank you for sharing.